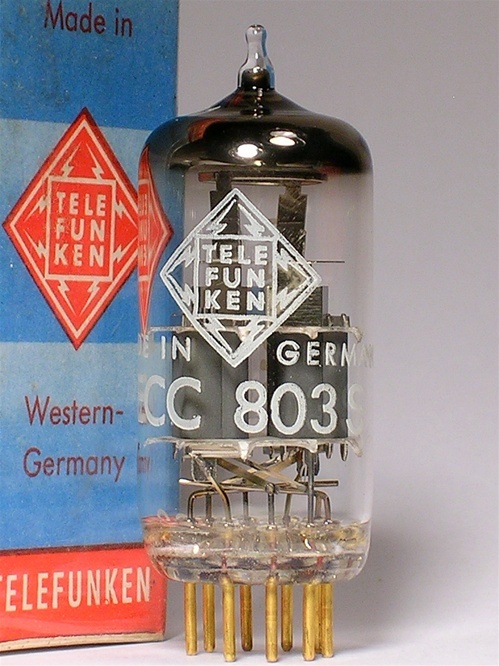 This is the finest ever NOS 1960's TELEFUNKEN ULM, 46 YEAR OLD PRISTINE NOS, THE MOST SCARCE of the ECC83 12AX7 variant designed for superior QUIET performance, 50,000 hour heater-life, PERFECT BALANCE, SHOCK & VIBRATION RESISTANCE, and high-bandwidth musical sound reproduction - TELEFUNKEN ULM "HOLY-GRAIL OF ECC83 12AX7 CLASS TUBES. PRICE IS FOR THE BALANCED & MATCHED TRIODE SINGLE TUBE! Transform your McIntosh MC-225 or any other 12AX7 amp into a SONIC-DREAM with this single tube. EXTINCT RARE "TREBLE-CLEF" CARTOON LOGO & BUGLE PLAYER.